The plate is laser marked with rings to make aligning parts visually easy. 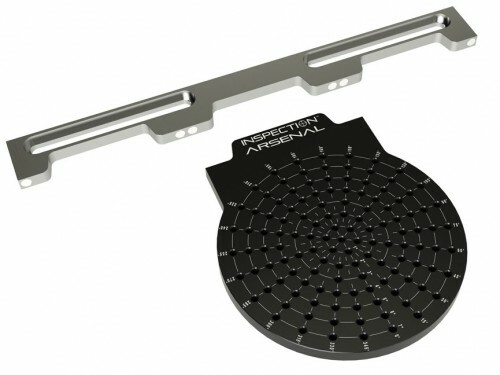 The signature Loc-N-Load™ shape is added to locate the plate in the docking rail for inspection. Magnets hold the plate accurately and securely and allow for easy release. Add Inspection Arsenal™ work holding, such as Silver-Bullet™, Trigger-Finger™ hold downs, stand-offs and more to enhance your setup. 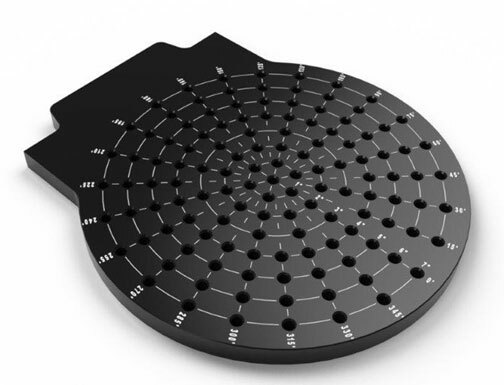 The new radial plate is the latest addition to the Loc-N-Load™ fixture plates system. Loc-N-Load™ aluminum fixture plates interlock magnetically to remain firmly secured, yet release quickly and easily for the next job. The system installs effortlessly on all CMMs. Selecting your system is easy with pre-configured CMM bundled fixture systems. 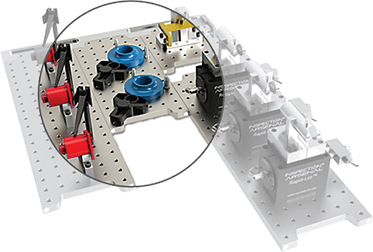 Select the docking rail and plate bundle that suits your application. 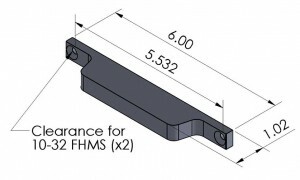 Choose from 12”, 18” or 30” rail and plate combinations (sold separately). Next, choose the size of work-holding kit that will suit your application — 51, 70 or 146 pieces. They all contain selections of the Inspection Arsenal™ trigger action, low-profile clamps, rails, stops, and hold-downs to enable quick and easy set-up. All docking rails, plates and work holding are also available for purchase individually.